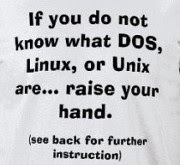 The following are some of the most commonly used MS-DOS commands and its equivalent in Linux. This cheat sheet is for those of you who have just switched from Windows to Linux and are just getting acquainted with the terminal. Take note that these commands usually have a number of options so be sure to check out the man page. To know more about each command, read its associated man page. Like for example, type man cp at the shell prompt to read about the "cp" command. I would like to compile a similar cheat sheet for DOS on Windows<->Biterscripting on Windows<->Shell on UNIX. How do I go about it ? This is what i've lookiing for... great work !